Every time she looks at her hand she will be reminded of your love, that will outlast the tests of time. 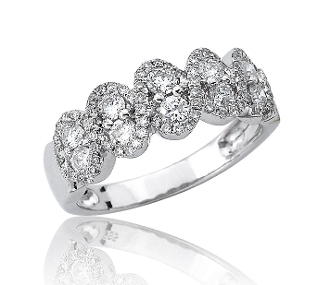 This ring features 78 breathtaking brilliant round cut Diamonds, set in 14 Karat white gold. Throughout this impeccable design are prong-set pairs of solitaires, captivatingly wrapped in pave set Diamonds running in two waves above and below, reflecting the symbol for infinity. This fabulous ring features 0.88 Carat t.w. Diamonds and a high polish finish. For added appeal personalize your item, select our Engrave option and indicate size needed when adding to Cart.